Hypothetical mechanisms underlying three approaches to pharmacological protection of normal cells from ionizing radiation. All the mechanisms depicted are based on the presumption that apoptotic cell loss is a central event in both the HP and GI components of acute radiation syndrome. Small molecules known as pifithrins (5), acting through unknown mechanisms, inhibit p53-mediated apoptosis, thereby rescuing HP progenitors. 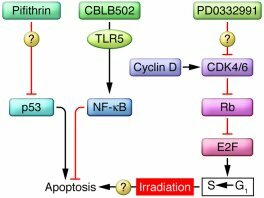 The flagellin derivative CBLB502 activates NF-κB by inducing TLR5 signaling, also leading to suppression of apoptosis. Unlike p53 inhibitors, CBLB502 is effective not only against the HP but also the GI component of acute radiation syndrome (15). Constitutive activation of CDK4/6 frequently occurs in tumors (e.g., by overexpression of cyclin D), leading to hyperphosphorylation of the tumor suppressor protein Rb, blocking its ability to repress the E2F family of transcription factors that are essential for cell progression from the G1 to S phase of the cell cycle. As shown in this issue by Johnson et al. (16), the synthetic small molecule PD0332991, a specific CDK4/6 inhibitor with unknown mechanism of action, protects the HP system from radiation damage, presumably by inducing Rb-mediated quiescence associated with suppression of apoptosis.